Are you looking for an editable ELA word wall set that's easy on the color printer ink? If so, this set is for you!! 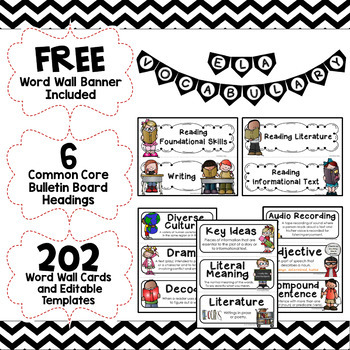 This ELA Word Wall set of 202 words is just what YOU need to enforce academic vocabulary and create an AMAZING bulletin board at the same time. Your students will refer to these ELA word wall cards over and over again! Click HERE to download the matching 4th grade MATH word wall set. Displaying academic vocabulary in the classroom is extremely important! Research shows that students need exposure to new vocabulary words multiple times before they reach mastery. 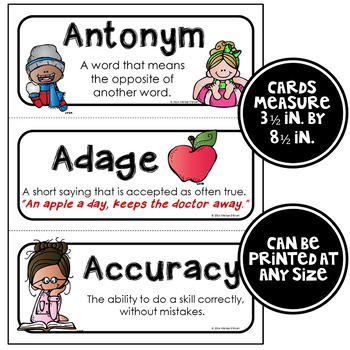 This 'no background' themed set of Common Core ELA academic vocabulary word wall cards is perfect for display in a 4th grade general education, special education, ELL or home school classroom. This word wall set was created based on the 4th grade word lists developed by the Common Core State Standards and contains ALL words from the Reading Literature, Informational Reading, Writing, Speaking and Listening and Language strands. These word cards can be used for words walls, bulletin boards, academic vocabulary folders, vocabulary notebooks, centers, flash cards and MUCH more. ►Pacing guide to help you organize your ELA vocabulary instruction. Words are grouped by standards to make your planning EASY!!! ►202 ELA vocabulary words. Download the preview for a sample of the words included. Each card contains the academic vocabulary word, a visual image and its definition. ►EDITABLE templates so you can add your own word wall cards if needed. 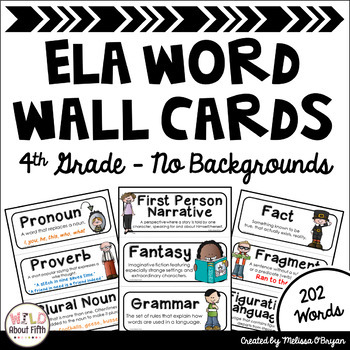 Looking for a different ELA word wall card theme (chevron, zebra print, black & white; rainbow colors, polka dot, nautical, no backgrounds or MORE), grade level (3rd, 4th, 5th, 6th) or BUNDLES? 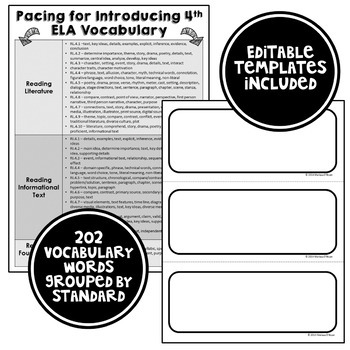 Click HERE to see all the Common Core ELA vocabulary word wall sets I have available in my store. Need a MATH word wall set to match? Look no further - available for grades 3rd, 4th, 5th, and 6th in polka dot, chevron, animal print, black & white, rainbow colors, nautical, no backgrounds and MORE. Click HERE to view all MATH sets. Are you teaching the CRITICAL VERBS and NOUNS of the Common Core? It is extremely important to expose your students to this test taking vocabulary!! Click HERE for a matching word wall set of the Common Core Critical Verbs. Click HERE for a Critical Verbs Instruction Packet with 12 weeks of graphic organizers and quizzes. Click HERE for Critical Verbs Games - a fun way to review instruction of these necessary academic vocabulary words. Click HERE for Critical Nouns word wall cards. Click HERE for a Critical Nouns Instruction Packet with 5 weeks of graphic organizers and quizzes. Please do not post electronically in ANY form. Please do not copy or sell any part of this product. To do so violates the Digital Millennium Copyright Act. Additional licenses for multiple use of the product are available for half off in my store. Thank you for your support!